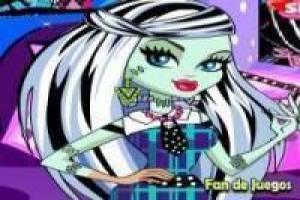 One of the protagonists of Monster High is Frankie Stein, the girl who is the daughter of the famous monster we all know. Now is the time to make a radical change to the appearance of the girl so that she looks completely renewed. You will have on the right side of the screen the interactive buttons with which to change the different aspects of the Monster High. In the first season you can vary the color of your eyes, your skin and add makeup. When you finish you can change your hairstyle, choose a dress and accessories that will look. Get to work and get a radical change in the appearance of Frankie Stein, the protagonist of Monster High. Enjoy the game Makeup at monster high, it's free, it's one of our Monster high games we've selected.